Although it may not be too obvious, I have been going through a few very hard weeks for several reasons. So someone who knows me well told me I should not be stupid, and should have fun. Let’s be it, then! As part of their James Bond 50 years celebration, MoMA has been showing some of 007 movies in their collection (the largest by any museum in the world). So yesterday I was invited, and I of course invited Stephanie to be my guest, to the screening of the latest James Bond movie: “007 Skyfall“. Guess who is in the movie (OK, everybody knew already but me, so?) fellow Spaniard Javier Bardem! So, how about the movie? 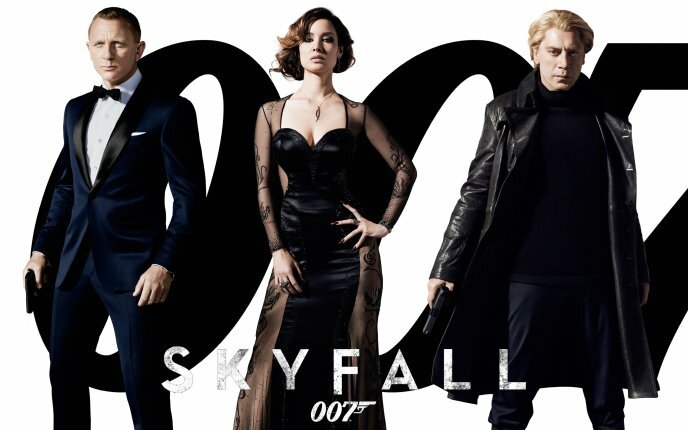 I enjoyed it because… let’s just say it’s another 007 movie. Perfect technical production, some brilliant moments (I love their artistic intros), some very weak plot points and attitudes (very dangerous defense of covert operations), messy clichés (the reckless and bloody hitman-corporate-terrorist improbable link), and an attempt to bring current events (powerful China, of course! ), technology (ascii in the hex column? unix X system showing a real time 3D in a dump mode? “evolving, self-reprogramming, obfuscated code”? really? that’s SO weak! you guys need a better tech advisor), and depth (childhood and unresolved trauma, beautifully scenefied in a remote Scottish house) to what it is, and is expected to be, just pure fun. So leave your Lacanian interpretations and your Bergman expectations at home, and enjoy the ride. If you can and will. You don’t need to “be warned” because 007 has always been that: circus, opium, fast food, simple joy, and even nostalgia (people clapped the most when he got into his Aston Martin vintage DB5!) and you know that, and sadly that’s exactly why the formula and the franchise work. Which intellectual doesn’t have a kid inside? which kid does not want to be a man (or be told what one should be even if that’s very wrong)? which simpleton does not want to be awed?